GUM® Rincinol® P.R.N. mouth sore rinse is an aloe vera based formulation that helps promote the healing of aphthous ulcers, irritations from orthodontic appliances and removable dentures, and minor cuts and abrasions. GUM® Rincinol® P.R.N. mouth sore rinse creates a thin, invisible, bioadhesive protective barrier which shields the sensitive nerve-endings from irritants such as food, drinks, braces, or dentures. GUM® Rincinol® P.R.N. mouth sore rinse provides fast and effective pain relief up to six hours. 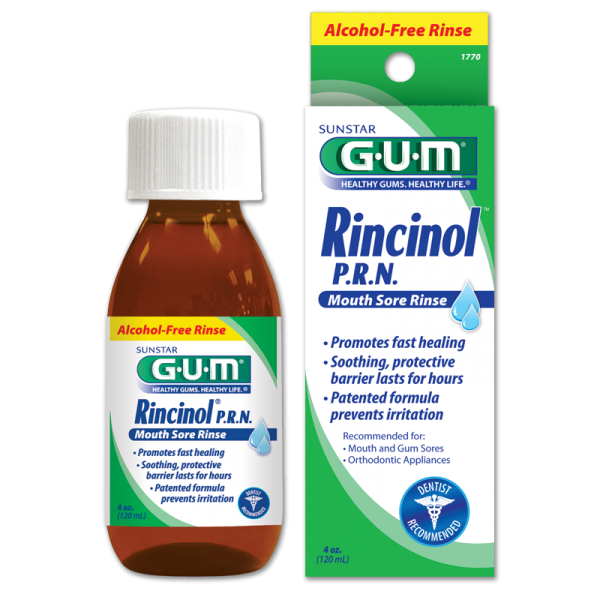 Unlike many other mouth sore gels and rinses, GUM® Rincinol® P.R.N. does not contain benzocaine which numbs the whole mouth or alcohol that stings on application.